This model’s hair was low-lighted with several Goldwell Topchic colors to achieve a dimensional effect. Levels 6 through 7 were used from the Copper Gold and also Brown Gold family’s. The hair was also prelightened with 5 volume lightener. Goldwell Colorance hair color glazes Level 9 Neutral were applied for an even tonal value of the highlighted hair. 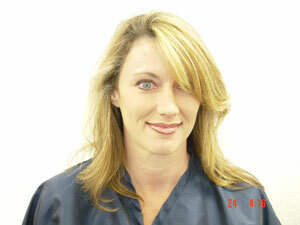 Goldwell Hair-color was used for this color correction and home hair care was prescribed. Porosity has a lot to do with corrective hair color. I like to play on this condition of the hair to achieve tone. MAC makeup was used for her photo shoot she is a professional model and enjoys the variations of hair color change often. This is a Before & After Model. A lot of it is in the makeup and contouring. A lot of services are done in the salon but the change of makeup is not prescribed to the client. Hair color changes I offer to the client every season, so when the hair color changes so does the makeup and the techniques of applying the product. This I feel is a lost art and a lost art not done given in the salon. Hair color and make up go hand in hand. But also remember this is a model so you have to do the hair color for the camera also the makeup. The effects of light on the skin and hair can dramatically change the tonal value of the hair and makeup also. What helped me in my hair coloring and makeup was to step away from the client and look at the results, get goo light bulbs. Try and save up about $600.00 to $700.00 and get yourselves a good camera and lean how to focus on out-door lighting. You will see you work and it is a great way to critic your self. I love to use Cannon good camera to work with. Then set up a photo shoot with clients take pics of them, then you will get better with your makeup and placement of hair color. That’s how I learned on my own.